Countless factors go into your decision for the best mobile forms and data collection tool for your business. You may be weighing features, ease of use, compliance, and cost. The comparison below can help you decide if Device Magic or Form.com is right for your business. You’ve probably used a mobile data collection system recently when you received a package delivery. After adding your digital signature, the delivery confirmation is automatically transmitted to the carrier’s data system, and it may trigger an automatic email notification for your records. This type of digitally integrated mobile forms solution is available for businesses of all sizes. Paper and clipboards have gone by the wayside, and for good reason. When information is entered digitally, either by staff or by clients, businesses can see higher data accuracy, improved productivity and time savings, reduced hard costs of paperwork, and increased regulatory compliance. Mobile forms have been used for many types of applications, including field reports, inspection sheets, digital timesheets, and countless other applications.Business success stories have included solutions to General Drilling’s need to get information back from remote job sites quickly, Channel Jets’ need for flexibility in form design, and the need for advanced security by the International Committee of the Red Cross. 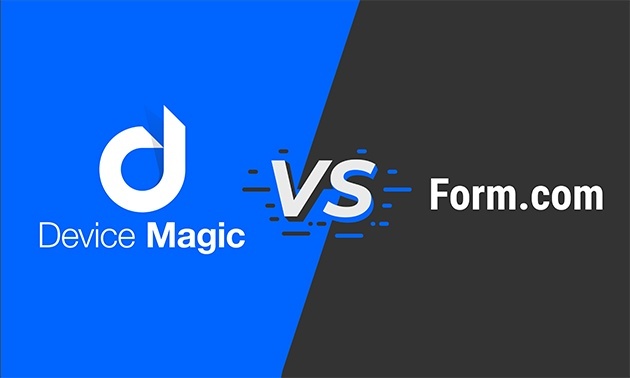 Device Magic and Form.com have many similarities in the features they offer. Both can collect data across different types of devices. Both allow for a variety of input types, including digital signatures. Each provides the ability to timestamp and geolocate when and where a form was completed. Additionally, both tools provide workflow systems so actions can be triggered automatically. Each offers offline access to use the forms in remote areas or in facilities with spotty internet. Both platforms provide user groups tools to limit form access and encryption for data security. While both platforms provide a similar set of features, the experience of using each platform can be significantly different. For example, Device Magic has long been committed to creating a user-friendly system so users don’t need coding to implement mobile forms. The UI is designed with the end-user in mind. For example, the drag-and-drop form builder makes it easy to implement basic or complex elements. Additionally, the analytics dashboard is an intuitive way to gather actionable insights. Software integrations, a key functionality of mobile forms, can increase business productivity and data synchronization. For example, a field inspection report can automatically log key information in your CRM for that customer's record. Form.com offers bi-directional integrations, and mentions Salesforce, QlikView, and third-party applications. While custom integrations with third-party systems are possible, it’s not clear how much of the integration is baked-in or how much of your IT resources are necessary in order to build, configure, and manage new integrations. Device Magic offers a large number of pre-built integrations with no coding required. It’s a quick setup process to integrate with platforms such as Google Drive, Dropbox, Slack, Zapier, Salesforce, SQL, Zendesk, MailChimp, email, SMS, and Evernote. In addition to the user-friendly data transfers of the predefined integrations, Device Magic also provides the capacity for advanced users to develop customized two-way data flows with the RestAPI. A direct plan comparison is difficult because Form.com doesn't publish its rates or plan information. Instead, interested users must request a quote. The company does say that it's focused on large and mid-sized organizations, which indicates that the pricing models may prioritize bigger companies. On the other hand, Device Magic clearly states its costs and included features. The Device Magic Standard Plan is just $25 per device per month when paid annually. Upgrading to the Device Magic Advanced Plan adds Zapier integration, custom branding, activity dashboards, and more for the annual rate of only $34 per device per month. Large businesses can take advantage of the Device Magic Enterprise Plan, which provides custom pricing based on your company size. App reviews provide a strong way to numerically compare the opinions about Device Magic and Form.com. At the time of this writing, the Device Magic iOS app has an outstanding rating of 4.6 stars from 391 users. Comparatively, Form.com iOS app has 3.9 stars from its seven ratings. Therefore, if Form.com wanted to catch up to Device Magic's high ratings, it would need to nearly triple its number of ratings with every additional reviewer giving it five stars. Device Magic and Form.com are two leading providers of mobile forms, and each offers a large set of advanced data collection features. Yet, while Form.com focuses on large and mid-sized businesses, Device Magic offers user-friendly tools that are handy for business of any sizes. User reports from Form.com reference a “steep learning curve” for advanced features. On the other hand, Device Magic’s focus on usability includes drag-and-drop editors and a wide collection of baked-in integrations. The higher reviews of Device Magic and its focus on usability set it apart from Form.com. Find out more about how Device Magic can help your business improve its information flows.